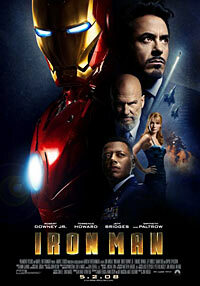 "Iron Man" is the best super-hero movie ever made. Stay all the way -- ALL THE WAY -- to the end, past the credits. You'll thank me. And bring a wet-wipe, you'll need it. I'm so blown away by this movie that I am up at 1:40 in the morning, too keyed up to sleep, writing this review. The longer version, containing random jumps from topic to topic, is after the jump. The visual effects are stunning. This is the first CGI film I've seen that is completely believable. At no point did I stop and say to myself "That's a computer graphic." I mean, I'm not naive, I know almost all of the full-armor stuff is computer generated, but it fits in with everything else so well it doesn't call attention to itself. An effect you don't think of as an effect is, my friends, a very good effect indeed. And this movie's full of them. The acting is outstanding. I completely bought Robert Downey as Tony Stark and Iron Man, both. That's not as easy as it sounds; an actor can do a good job with the alter ego and not so good with the hero. Or neither, of course (paging the entire cast of "Fantastic Four"!). Downey absolutely nails this part in every respect. Ditto for Jeff Bridges as Obadiah Stane and Gwyneth Paltrow as Pepper Potts. Great, great stuff. The only one I didn't care for all that much was James Rhodes, but even in the comics that was a fairly dull character, so I'll give that a pass. The story is fantastic, in all the best senses of that word. Completely believable (in a comic book way, of course), very engaging, fun without being campy, and chock-full of killer dialog. I felt like I was back watching "Swingers", with that wonderful snappy banter. I was surprised Favreau didn't get a writing credit, the dialog seemed very "him". The main moral dimension of the story was great, too, allowing you to take away a great number of angles on it without being heavy handed in editorial tone at all. Three words: Believable repulsor beams. Awesome. A common problem with super-hero movies is that an awful lot of time gets spent doing backstory stuff -- here's the character's birth, here's the character's upbringing, here's how he got his powers, blah blah blah. "Iron Man" dispenses with all that in a thirty second video pitch, and immediately launches you into the creation of the super-hero identity. It's hard for me to overstate how well paced this film is, and I think that storytelling decision is the main reason. From the opening scene you're right in the middle of Iron Man the character. Johanna Draper commented on her site that part of the reason for this may be that there's not a very big delta between Tony Stark and Iron Man. In many ways Stark himself is a larger-than-life super-heroic kind of guy already, so the transition to the armored version isn't jarring at all. You don't have to spend mental effort adjusting to the idea of meek Peter Parker suddenly beating up bad guys, or scratching your head wondering why Superman bothers being Clark Kent at all. Look, that's enough digital ink spilled already. I don't want to give away plot points, because I hate reviews that do that. Go see the freaking movie already. Go on, git! What the heck are you doing still reading this! Go already!! And wait until the end of the credits. That's very important. Don't forget the wet wipe. Yeah…I should have brought a wet-wipe. Ii know what you meAN. I saw it twice this weekend. Amen to that, Eric. Geez but “Hulk” was boring. Not an awful movie, but sooooo long. And I kept thinking it was over; I got up at least six times thinking it was done, only to sit back down again. (small SOPILER included)That movie…was…AMZAING!!!!!! I was sooooo excited, and it didn’t dissapoint at all! I loved the set-up for The Mandarin and everythign felt so perfect! Like the comic book character literally brought to life! IRON MAN!!!!! You’ll need a wet wipe because you’ll get so excited you’ll … spit. This movie was AWESOME. It beat spidey 3 by a mile. Heck, let’s restate that… It beat Spider-man 3 by a couple of laps around the Solar System. If I didn’t know any better, I could actually believe the armor was for real. And Downey Jr. was P-E-R-F-E-C-T as Stark. I wouldn’t be surprised if the artists drew Start with Downey’s likeness in the comic from now on. That’s how much he fit the part.